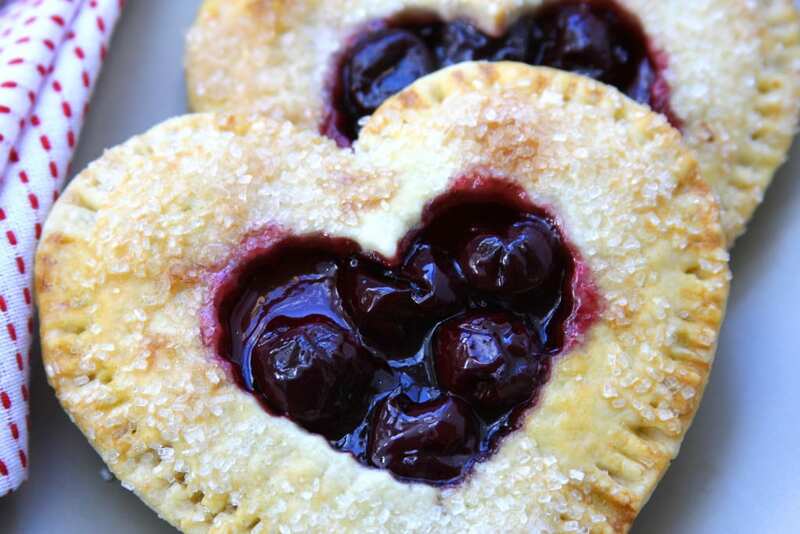 Homemade individual Cherry Heart Pies, with flakey buttery crust and sweet bold cherries make the perfect treat for Valentines Day. The best part is no artificial ingredients so you know your sweetheart’s treat is only the best. I absolutely love Valentines Day and always have. I will be 92 and I will still love Valentines Day. I have heard all the arguments, that it is a made up holiday by corporations to make money, that we are forced into buying stuff that makes no impact on our relationship and lastly, how it makes people feel sad because they do not have a significant other. As much as I get those arguments, I still love it. Maybe my love of the holiday stems from childhood and how fun it was to give and receive Valentines or because I love heart shapes or because I am a romantic at heart and always will be. Whatever the reason, there is just something so enchanting about this holiday. For many men, I think this holiday brings a ton of pressure. Feeling like they have to buy the perfect gift so their other half won’t be upset or just simply having to express their love in a way that isn’t comfortable for them. For any man feeling this way, here is a little secret about this holiday you may not have been told yet. It isn’t about buying the perfect gift or spending a ton of money. It is about showing love in a way that your significant other feels. It is about knowing your loved one and putting effort behind your offer of love. Which is really something we should be doing every day in our relationships. 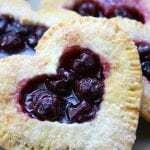 It could be a homemade Valentines card, a cuddle session on the couch watching a romantic movie ( I can here the men gagging already) or making these Cherry Heart Pies. The secret is to know what speaks to your other half the most. *On a side note, if this is something brand new to you, I highly suggest reading Gary Chapman’s “The 5 Love Languages” and really identify what language you are and what language your sweetheart is. This one book, when applied, can make a huge difference in the strength of your relationship. My husband and I actually worked on this Cherry Heart Pies recipe together. Paul is very good at making breads and pastries, where I am really good at the savory items. It was a no brainer that we do this together. He has researched and experimented with many pie doughs recipes. Some we liked and others tasted good but just have the pretty factor. 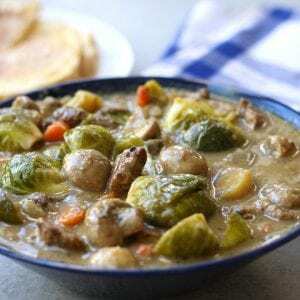 Well, he hit a home run when he found this pie dough recipe inspired by Ina Garten’s, Perfect Pie Crust. 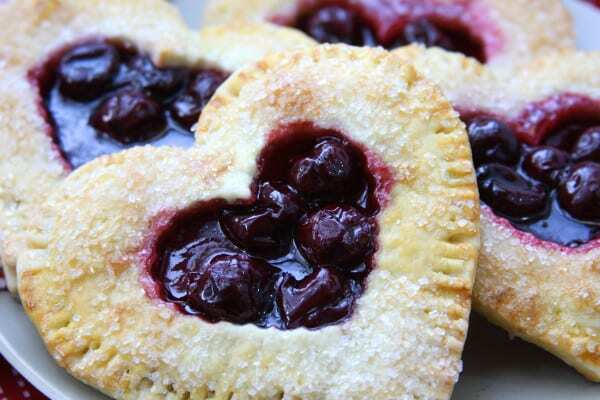 He worked with her recipe, made changes that fall in line with the values of The Fed Up Foodie and it worked perfectly for these Cherry Heart Pies. The crust is so perfectly buttery and flakey. It also bakes to a wonderful lightly golden brown. After cutting out the top and bottom crust, refrigerate again for about 15 minutes. By doing this, it helps to keep the heart shape intact while sealing the two layers together. Make the cherries the day before or long enough for them to cool in the refrigerator. 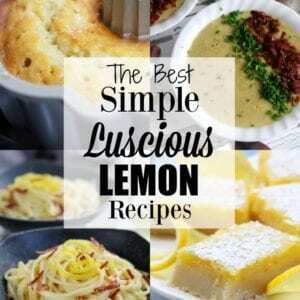 This will help the cherries from spilling out the sides. You will still have a little spillage, but definitely less then if you work with warm cherries. Bake on parchment paper and clean up will be a breeze. Bottom layer for Cherry Heart Pies. Top Layer for Cherry Heart Pies. Cherries used for Cherry Heart Pies. To seal the two layers of the pie, poke fork 1/4 inch from edge and then press down. 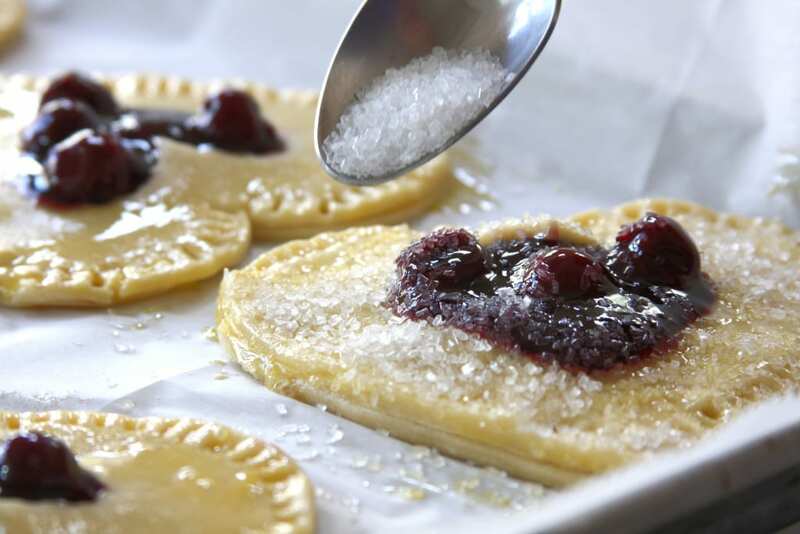 Once pies are assembled, wash with an egg and sprinkle with sparkling sugar. 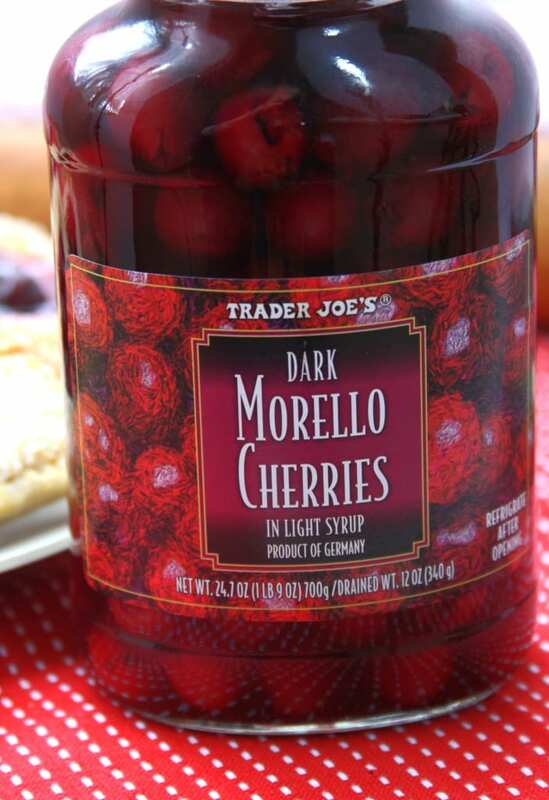 For Cherry Filling- If using jarred cherries in juice (like the one pictured above from Trader Joes) thoroughly strain cherries through a fine mesh colander reserving the juice. Set cherries aside. Measure arrowroot into a small bowl. Add approximately 2 tbsp juice, mixing well, making a slurry. In a medium sized saucepan add sugar and remaining juice, stirring to start to dissolve sugar. 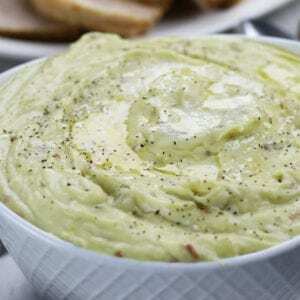 Add juice slurry and cook over medium heat, whisking consistently until thickened, about 3 to 4 minutes. Let cool slightly and then stir in cherries. *Letting cherries cool in the refrigerator either overnight or for several hours will help prevent cherries from spilling out through sides. For Pie Crust- (Double pie crust recipe in separate batches to accommodate filling) Cut chilled butter into small chunks and place back in refrigerator while preparing dry ingredients. 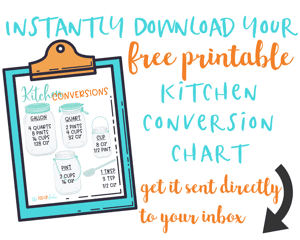 Measure flour, salt and sugar into a food processor, fitted with steel blade. Pulse a few times to incorporate. Add diced butter and pulse until butter is the size of small peas, approximately 8 to 12 times. With food processor running, slowly pour ice water into feed tube and then pulse machine until dough begins to form a ball. Dump dough onto floured board and roll into ball. 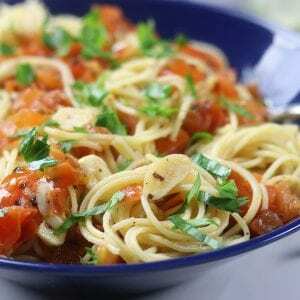 Wrap in plastic wrap and refrigerate for 60 mins or until needed. Assembly - Preheat oven to 400℉. Cut refrigerated dough in half and then roll each half on a well-floured board into a circle. Using a rolling pin, roll from center to the edge, turning and flouring dough to ensure it doesn't stick to the board. Roll between 1/8-1/4 inch. 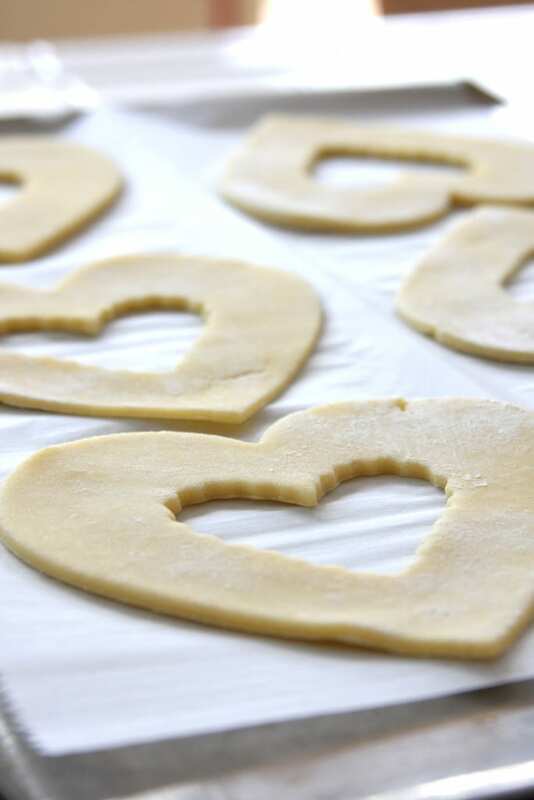 Using largest heart shape cookie cutter cut dough into shapes and place on cookie sheets with parchment paper. Using smallest cookie cutter, cut a heart in center of half of larger hearts. 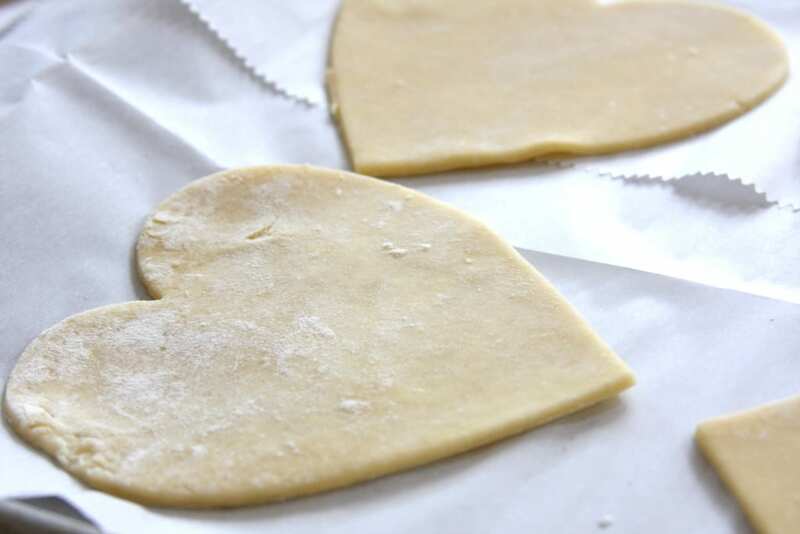 Placed cut pie crust hearts back in refrigerator for about 15 mins. 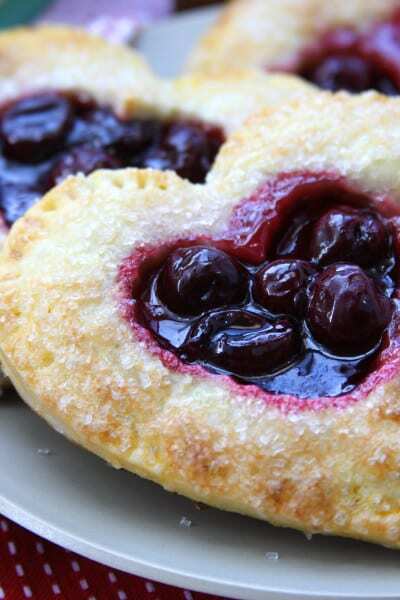 Place approximately 1 1/2 tbsp of cherry filling in center of uncut hearts. 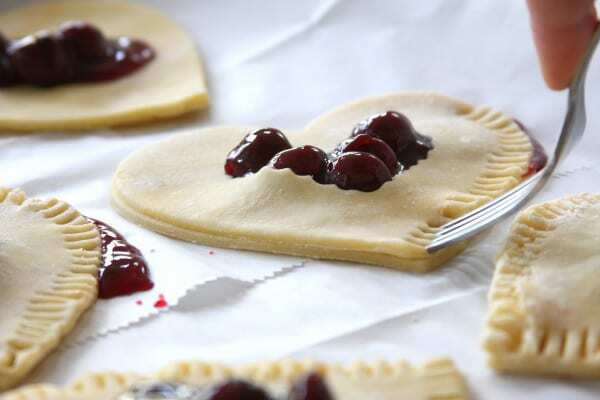 Place cut hearts over top of cherry filling. With a fork, poke about 1/4 inch from edge and then press down, closing two sides of crust together. Whisk egg in a small bowl and using a brush, wash down top of pie with egg. Sprinkle the sparkling sugar on top. Bake for 15-17 mins in 400℉ or until lightly golden brown. Double pie crust recipe in separate batches to accommodate cherry filing.